The Mags Sofa is already a true classic in the range of the Danish manufacturer Hay. In addition to the single, modular elements, it is also available in an preconfigured version. In the corner combination 2 version, the sofa consists of three seats, as well as a chaise longue module placed on the desired side, which invites you to relax your legs. A pleasant spring system, stable foam and high-quality upholstery characterise the quality of the Mags Sofa and ensure a long shelf life. In addition to its practical advantages, the sofa also has an outstanding appearance: Harmonious proportions and clear lines make it seem minimalist and elegant, so that its generous proportions do not have an obtrusive presence in the room. Its compact design with no loose cushions make it an adaptable sofa that can be personalised with colourful or plain cushions. We are happy to help you create your customised Mags sofa. In addition to other modules, there are also various fabrics (including leathers) and a variety of colours available. In the corner combination 2 version, the sofa consists of three seats, as well as a chaise longue module on the desired side, which invites you to relax your legs. 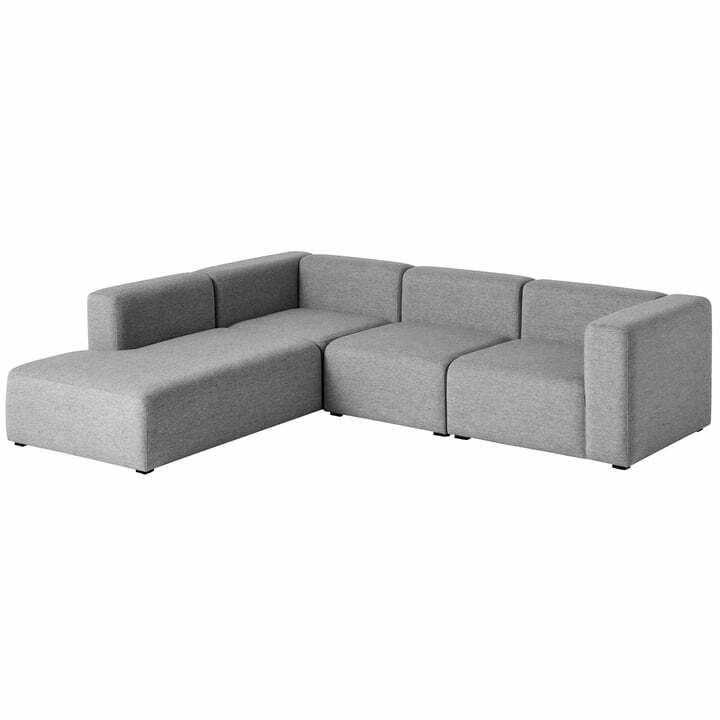 Lifestyle product image of the Mags Sofa 2.5 seater, combination 1 by Hay in light grey (surface 120) The sofa in light grey is great in any living room.